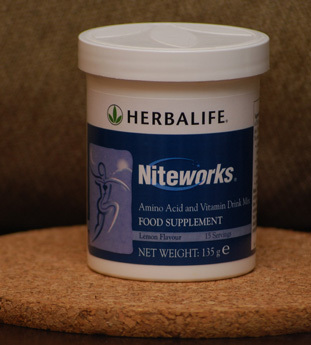 Herbalife Niteworks is a night-time food supplement with L-Arginine and L-Citruline plus vitamins C and E and folic acid. During the night, when Nitric Oxide is naturally at its lowest level, take Niteworks™. Take Niteworks™ before you go to bed. Just add Niteworks lemon-flavoured powdered mix to cold water, sparkling water or juice, for an instant drink.